Gregory Hartnell has lost another election. Over the years, the Victoria artist and civic activist has run for city council “four or five times” including this year, and for mayor twice. And always he loses. Hartnell and the other two members of his slate, Patrick Jamieson and Father Allen Jones of the Old Catholic Church, came out strongly for the homeless. They believe they helped raise it to the status of number one issue in Victoria’s mayoralty race, which saw social agency bureaucrat Dean Fortin elected mayor. Fortin made homelessness the theme of his inaugural comments; but he also spoke positively about an upcoming vote on raising his salary by $23,000. Hartnell, nothing if not an independent thinker, attacked “socialist” Fortin for even considering such a thing. Hartnell’s approach to the homeless doesn’t follow conventional lines, either. He thinks most of them are substance abusers of one sort or other, who should be in 12-step programs based on Alcoholics Anonymous. As for so-called ‘harm reduction’ plans that provide methadone to heroine addicts and clean needles to intravenous drug users, these he condemns as “a failed policy. He sounds like a hardliner, but he also brings homeless people into his own spotless, sunlit home in Victoria’s scenic Rockland neighbourhood for a shower and a meal. “My wife Dawn just insists the bathroom is cleaned up when they leave,” he quips. 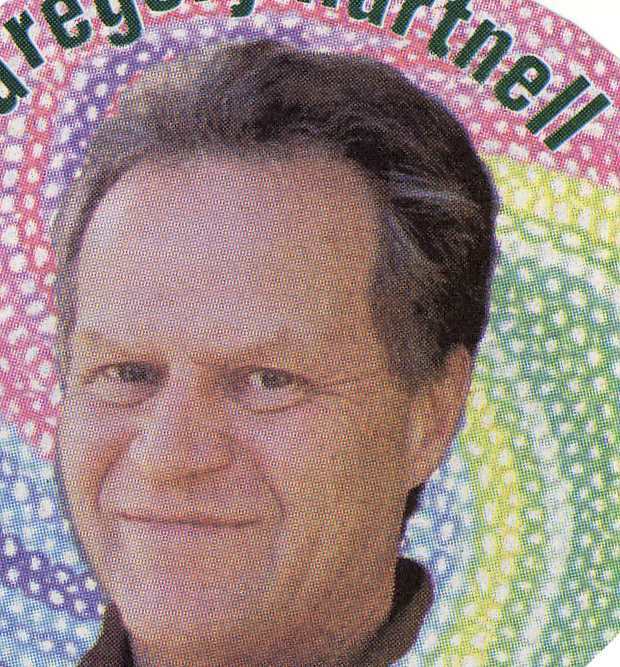 Hartnell was raised Catholic in a large, affluent Victoria family – but during his first stint at university in the 1970s, he strayed toward the Baha’i faith. Hartnell returned to university in the 1980s, studying simultaneously at the San Francisco Academy of Art College and San Francisco University. There he got heavily into “boozing” and involved with a woman who was also a “boozer,” which led him to Alcoholics Anonymous. He also got involved with the St. Ignatius Institute and its strong commitment to the pro-life cause. Now his pro-life commitment has broadened to include his efforts for the homeless and his support for campaigns to stop clearcutting of Vancouver Island forests, and to keep American nuclear-powered or nuclear-armed naval vessels out of Victoria harbour. Hartnell’s art, which adorns his house and is most often seen on the cover of the Island Catholic News, the anti-hierarchy independent monthly published by fellow council candidate Jamieson, is a mostly religious mixture of the symbolic and the geometrical. He is experimenting now with blending the Christian cross with the Eastern mandala. Other recent paintings depict Christian saints – but with Hindu-like red dots on their forehead. This, however, owes its inspiration not to India, but to the art of 12th century Spain – where the red dot represented the blood of Christ.